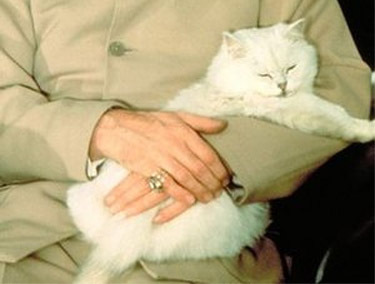 POLL: Time For The Bald Truth − Who's The Best Blofeld In The James Bond Franchise? Almost as enduring as James Bond himself, Ernst Stavro Blofeld was a supervillain caricature even before Mike Myers turned him into Saturday Night Live creator Lorne Michaels with a skull cap as Dr. Evil in the Austin Powers franchise. In the opening sequence of For Your Eyes Only, an uncredited character who is presumably Blofeld — the cat and the clothes certainly leave that impression — is finally dispatched by being dropped into a smokestack by Agent 007. As was the case with Blofeld's first two cinematic appearances, he is portrayed by two actors: John Hollis (body) and Robert Rietty (voice). And yet, the baddie manages to make one more appearance in the independently produced Never Say Never Again, where he is played by Max Von Sydow. While you're taking a break from trolling Bond chat rooms to see if Blofeld will return during the Daniel Craig era, vote for your favorite Blofeld. We've included even the minimal performances because we are completists at heart, and we know you are, too. If you haven't voted for you favorite Bond movie, that poll is still open, too, and Craig's debut turn in Casino Royale is currently winning. Vote For Your Favorite Bond Movie Here. Your own article features verified useful to myself. It’s quite educational and you're simply certainly extremely well-informed in this area. You get opened my personal eye to be able to numerous opinion of this kind of subject matter together with interesting and sound content. The majority of contain special quests and group attempt. Remaining multi-player games and everything, they will effortlessly supply the adrenalin that will young boys always appear to watch out for throughout each game how they play on-line. Even so, multi-player are usually generally log-in game titles. For what cannot be cured patience is best.